Whether you’re looking for a way to stay fit or a means to reduce stress, yoga offers both – and more. Bainbridge Yoga House emphasizes yoga instruction within a nurturing community setting for people of all ages and skill levels. Nearly a dozen teachers offer a variety of classes including asanas, pranayama, heated classes, meditation and chanting, seven days a week. 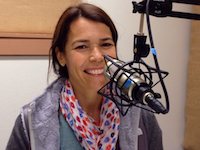 In this “What’s Up Bainbridge” podcast radio episode, BCB host Annie Osburn interviews Jen Breen, founder of Bainbridge Yoga House, about her studio’s Happy Hour class, held each Friday from 5.30pm to 6.30pm. Happy Hour yoga is available to anyone in the community, regardless of experience level or age. Island Kirtan offers live music occasionally. Classes are taught by studio staff and offered at a reduced rate of $5. Beginners welcome. No flexibility necessary! NOTE: BCB plans to cover a mix of nonprofit and business venues and events, so watch for a variety of local venues in future episodes of What’s Up Bainbridge.